The Hahn-Echo experiment applies a 90 degree pulse, waits a period of Tau, and then applies a 180 degree pulse. This causes an echo in the FID response of the sample, which peaks at a duration of Tau after the end of the 180 degree pulse. The Hahn-Echo experiment program is available for download at the bottom of this page. Figure 1 shows the resultant FID response when capturing data continuously during a Hahn-Echo experiment. The large negative spike is caused by the 180 degree pulse being applied. 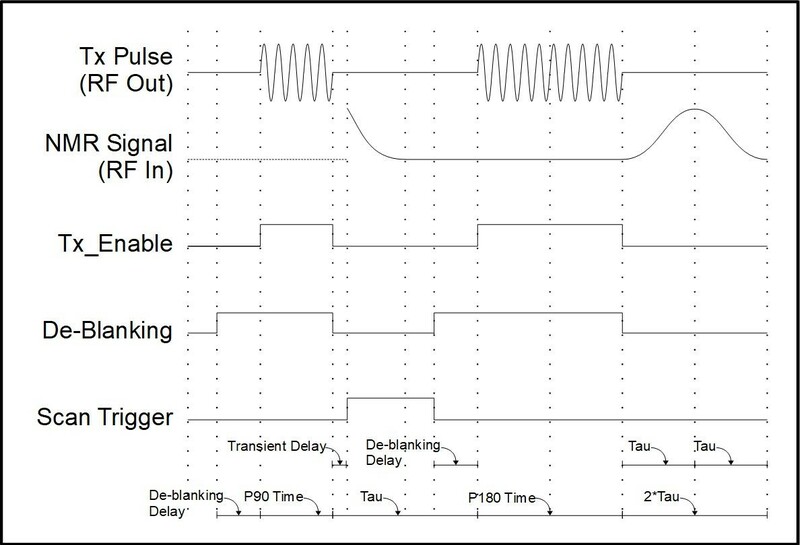 Figure 2, below, shows the pulse sequence used by the RadioProcessor to perform this experiment. Each vertical line is a new instruction, and the names of the durations used are shown above each time range. After following these procedures, the hahn_echo.exe will run with the specified parameters and print those parameters as well as the progress of the experiment to a terminal window. Once experimentation is finished, it will save the results to ASCII, JCAMP, and Felix files. 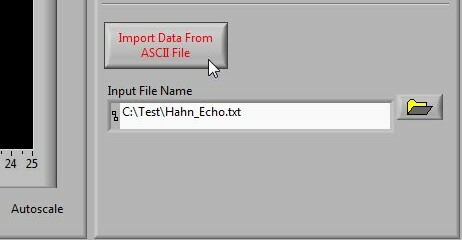 After execution of the Hahn Echo program, the output files can be used with external programs to visualize the data. Point the 'Import File Name' path to the Hahn Echo's .txt output. Press 'Import Data From ASCII File' to view the data. The Felix NMR program can process .fid files. To do this simply ensure that the Felix NMR program is installed properly and double-click on the .fid file. Find the values of spectral width and number of points which optimize the signal-to-noise ratio without cutting off the FID. Find the 90 and 180 degree pulse widths. These are the amounts of time it takes for a transmitted pulse to cause a 90 and 180 degree FID response. The 180 degree pulse width should be roughly double that of the 90 degree pulse width. Find the resonance frequency and output phase which achieve a maximum real amplitude at the start of acquisition. The value of the first real data point should be a maximum, and the value of the first imaginary point should be zero. Estimate the TAU time. This should be approximately equal to the time it takes for your Single-Pulse NMR FID to decay to zero. The FID from the initial 90-degree pulse should match the Single-Pulse NMR results. Adjust the TAU parameter as necessary to produce the desired echo. A larger TAU will result in a more diminished echo. You can also increase the NUMBER_OF_SCANS parameter to average results over multiple runs. This will improve signal-to-noise ratio.